On the average, a dog should be groomed every 4-6 weeks. Some may need more frequently and some less depending on the breed and the cut style. It also depends on the owner's ability to do daily brush outs and how often the dog goes outside. We require a 4 week schedule as it leaves the dog in a well maintained condition with less stress and less grooming time. Locking in a set schedule allows your dog to stay maintained without having to wait until you can be fit in. Call or text to discuss your pup's individual needs. Grooming takes place in a fully self sufficient grooming trailer. The trailer comes equipped with a tub, fresh heated water, electric and most importantly AIR CONDITIONING! No hot dogs here!! If you come to my home, where do you set up? Depending on your neighborhood and the elevation of your driveway, I either park on the street in front of your home or I will pull into the driveway. Do I have to be home for you to groom my dog? No, however the first time it is preferable so that I can meet both you and your fur baby and I can familiarize myself with the home in cases where you my be leaving access while you are away. Most of my clients leave a key afterwards if they are unable to be there. Convenience to the client is key. ​Can I stay with my dog while they are groomed? ​​Unfortunately due to insurance liabilities and for the safety of the pet only the groomer is allowed in the trailer during the grooming process. You are free to tour the trailer upon the initial visit as mobile grooming can be somewhat of a new concept to some. 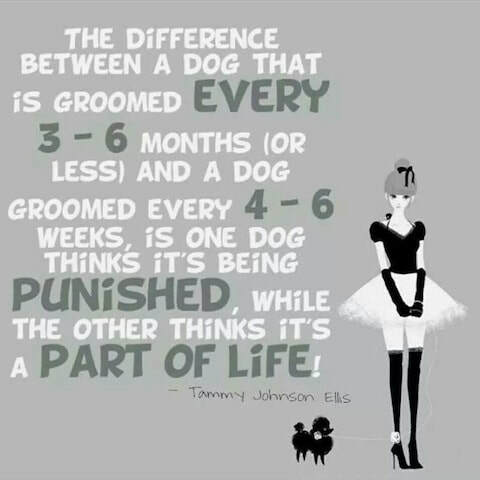 Pets are always in the best care while being groomed and their safety is of the utmost concern. Many pups are distracted by their owner if they are present and thus presents a possible safety issue while the groomer uses clippers and sharp tools to groom. ​Times vary based on breed, cut preference and personality. A good average for small dogs is typically 45-60 min. Medium breeds 60-75 minutes and larger breeds can take 60+ minutes. The first appointment may take longer but on a regular schedule will tend to be the average times listed above. Why does my dogs haircut cost more than my own? 1. Your hairdresser doesn't give you a bath. 2. You don't go for weeks at a time without washing your hair. 3. You don't roll in nasty things before seeing your hairdresser. 4. Your hairdresser doesn't have to clean your ears. 5. Your hairdresser doesn't have to demat your hair. 6. You sit still for your hairdresser. 7. Your haircut doesn't include a manicure or pedicure. 8. Your hairdresser only cuts the hair on your head. 9. You don't try to bite or scratch your hairdresser. 10. The likelihood of you pooping or peeing while your hair is being cut is slim.